Like a good few people on the build hub it's taken us a while to get to the point where we are finally breaking ground. 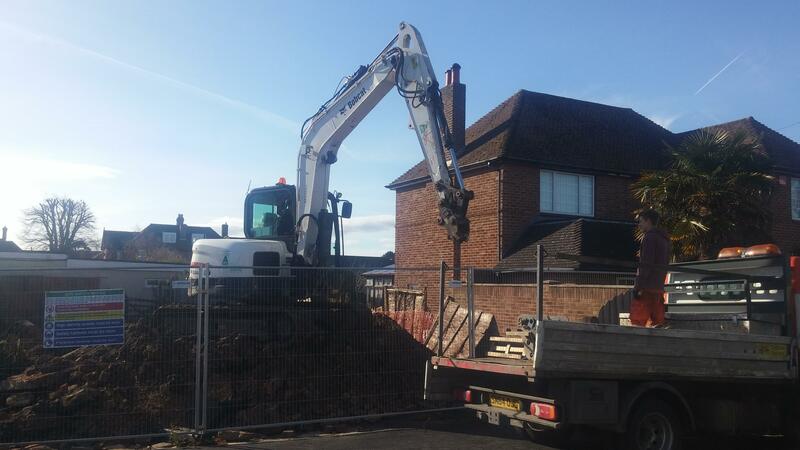 We now have the diggers arriving the week 11/02, so time to get blogging. I'll start by providing some background and project overview. We'll update the blog as we progress. We started well over a year ago, kids grown up and house more than we needed, and both with no intention of ending up in sheltered accommodation. Fortunately for us our existing house is on a corner plot with a large detached garage providing an opportunity to build a small house without detracting from the original house. We want to future proof the house as far as we can. Having played with the idea for a number years we started to actively look at what we could achieve. It was not long before we came across the concept of passive housing. We ended up speaking to PH15 and to Zero Bills (Zed Factory). PH15 do passive house timber frame solutions, had a really good feel about the organization but quickly realised they were talking much bigger budgets than we could manage. After a visit to the building research establishment (BRE) and a look at the Zed Factory house there we decided to take a look at that route. ZED provided either a shell or turnkey solutions, both of which were within our budget. The cost per square metre in the ZED literature at BRE indicated a very competitive turnkey price in the region of £1,350 a square meter. As with all things the low price came with compromises as it was a “cookie cutter” solution and finish was not all that we would have liked. We had a meeting with ZED, to talk about what we wanted. It quickly became apparent that the “small changes” we would have liked came at a very high price pushing the cost per square metre to £1,6434 which is in the region of 40% higher. Some of the additional cost were also high, for example £7000 for preparing tender documentation, £4500 for planning documentation and £5000 for building control drawings. All in all a deflating experience, got the impression that ZED are structured for big developments not the self builder. We took a while to get over the disappointment of the ZED negotiation and ended up going to a self build show a couple of months later at Bicester. It was a good show and we came across MBC who had a small unassuming stand, one technical guy and a very satisfied customer. After a long chat we realised we could achieve our build for our budget and get a house designed for us rather than generic build. Planning permission was the next big hurdle. We had spoken to our neighbours over the years about the opportunity to build on our plot to replace the garage with a small house, they had not raised any objections. At this stage we used Sketchup to model a couple of designs and engaged with the local planning department pre-planning process. This was very useful as it allowed us to establish what would and would not be considered, basically set the boundaries for us to push. We came away from the process with the knowledge we could probably build but not necessarily on the scale we wanted. At this point we found a local architect and started the design process and the subsequent planning approval process. The design process is a odd one, conflicting interest between the architects creativity and what you want to build and can afford. It's certainly a phase that having done once you are a lot wiser. Not a disastrous relationship but a very frustrating one. In any event after a couple of iterations with our planning officer we reached a point where we could submit a planning application. I'll not go into the problems we faced in planning other than to say it's arcane and the neighbours who were supportive at the start now raise issues with bat flight paths, ancient privet hedges and many more distractions. In any even after going to committee twice we finally got approval. At this point it should have been simple order the MBC kit...enter the build hub. Having done a bit of reading on construction techniques and their problems we decided to take a look at ICF as it was comparable in price with timber frame without some of the long term problems that timber frame can face with external water ingress. More research looking at ICF block led us to JUB who had a “no cut on site solution” which appealed. The block are not flat pack and have substantial webbing which should reduce the risks of bulges and leaks when the concrete is cast. Having selected a brick the next problem was to find a builder. Not as simple as we would have thought as builders who use ICF are would appear in the main to be in exclusive partnership with the a block manufacturer. In the end we went with “Intelligent Building Solution” a firm with considerable ICF experience who are based in Glasgow. The web site literature for JUB sells the blocks as a well established solution. JUB have integrated raft, wall roof and render systems which should minimise compatibility issues. It was not long into the process before we discovered from sources other than JUB that they had not built any houses in the UK. The bricks are in use in Europe but mainly in off the peg solutions, in the UK it's being marketed as a solution that can build pretty much any house you like within a 75mm of your design. The marketing support for the blocks is best described as tentative, having nothing to base there quotes on. We had expected them to be keen on getting a build under way but getting a competitive price was not straight forward. At £79 per square meter for the 390mm blocks and £58 for the 300mm blocks put it toward the high end for ICF. What I will say in their favour is that the technical support has been excellent. We are now dealing direct with the JUB technical guys in Slovenia and they are being very practical and helpful. 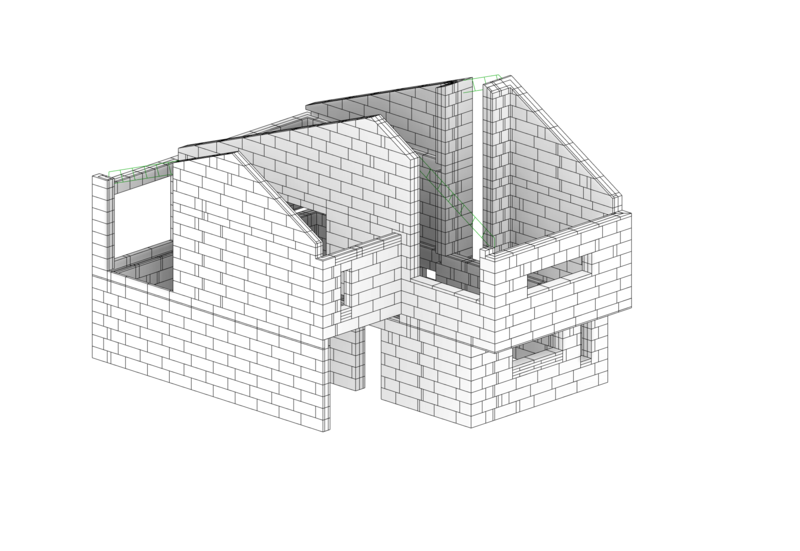 One problem you face with the JUB solution is that the block plan can alter the build dimensions, not only by the 75mm figure but also to simplify wall interfaces. The result is that you have a bit of a “chicken and egg” dilemma with what order you get things done in. We opted to get a first pass on the ICF block layout and use this as input to the structural engineers. This has worked out well with only minor rework of the calculations and amendments to block layout. As far as finding a firm to do the calculations, our builders warned us to go with a firm who were familiar with ICF to prevent over specification of the steel in the structure. We ended up getting in three quotes and decided on Tanner Structural Design a firm used by others on the buildhub. Not having any experience of the process it was most refreshing to deal with Tanners. I have no reservations recommending them, their communication was excellent and they were happy to take external input into account. We wanted to get build insurance. JUB recommended BLP. We got quotes from Advantage, Aedis, BPL, and Global Home Warranties. We wanted to combine the warranty with building control as we figured this would get the best result for us on the basis “if your going to provide insurance it's in your interest to make sure it's built properly”. BPL provided a very expensive quote so have been ruled out. Aedis put additional liability on the builder which may discount this option. It will be interesting to see just how usable the service turns out to be. This proved to be a decision that consumed a lot more time than anticipated. Who would have thought there would be so many manufactures out there, spoilt for choice I think is the expression. The build hub proved a very useful source of information and advice. We very nearly went with Rhino who make a very competitively priced double glazed aluminium solution. In the end we went with triple glazed windows from Velfac which rather stretched the budget but we felt would pay back in quality of living/comfort. This was a new area to us like so many when you come to self build. In order to do the raft foundations design the structural engineers needed us to get site soil test done. We duly got in three quotes, the cost was a complete surprise as it was not an item we had budgeted for. Professional fees of over £800 for an engineer on site for the day, sample holes, and reports drove the figures close to the £3000 mark. A bit of research opened a whole new world of soil plasticity. We contacted our structural engineers to establish what they required and they were happy with the soil plasticity figures. More digging and we found a firm Ashdown Site Investigation who provide site survey and laboratory services. They were happy to do sample analysis and only charged £35 for each sample. We dug a hole 1200 deep taking 1kg samples for each layer, in our case there were just four pretty well delineated layers. We bagged and labelled the samples with their depth from the surface and sent them of for analyses. A week later we had the information required to do the structural calculations.